What is the first thing that comes to mind when you hear the term "flower arrangement"? Do you think of weddings? Centerpieces? Stuffy, grandma's house arrangements? Until I got my own place, those were the things that came to my mind. Then I realized how much fresh flowers (or great looking artificial ones) can brighten up your home. The best, fool-proof way to add flowers to a room without looking over-the-top is to stick with one type of flower in one color. 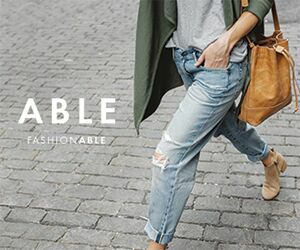 This gives a more modern feel. Lose the greenery; it can make the arrangement stuffy if not done exactly right. 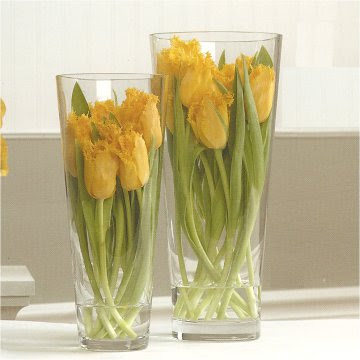 Select vases that suit the flower. This tulip arrangement is gorgeous. Since tulips stems bend over time, I love how this keeps all the blooms right together for a color burst. Roses have a strong fragrant- too much for my liking. 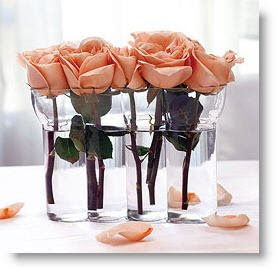 This vase holds five blooms which is just enough to scent a room. This would look great centered length-wise on a coffee table or in front of that horrible television set we always try to hide. 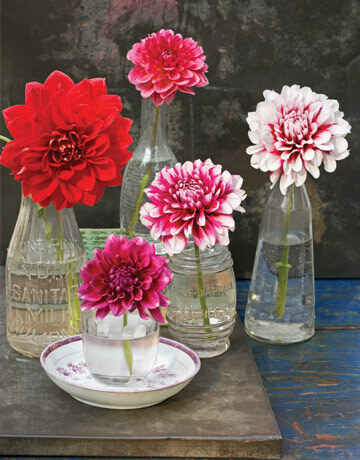 http://www.countryliving.com/ This arrangement of dahlia's is gorgeous. It is feminine, southern, and sweet; everything I love. I recently copied this arrangement for a girlfriend brunch centerpiece. Feel free to deliver some to my home! Funeral flowers are great but I need some blooms.